Within days of the recent Nintendo Preview Event UK retailers started taking pre-orders for the forthcoming Wii U console which is due for release on 30th November 2012. The online retailer Zavvi started off with the best prices with the Wii U Premium Pack model being sold at £274.99, the Basic at £229.99 and the Premium with ZombiU bundle at £299.99. Zavvi have since aligned their prices along with other retailers at the cheaper end of the market, however Zavvi will honour these bargain prices to customers who have already ordered at this price. They are currently asking £299.99 for the Premium Pack (an extra £25). Amazon and Tesco Entertainment are currently charging £299.00 for the Premium, however Toys R Us are currently the cheapest at £289.99. Toys R Us also currently have the cheapest deals on the Wii U Basic Pack (£244.89) and Wii U Premium ZombiU Bundle (£319.99). You should however bare in mind that Amazon, Tesco and other websites have a pre-order guarantee whereby if the price changes between your order date and the release date you will only pay the lowest price. Toys R Us have no mention of a price guarantee on their website and you therefore run the risk that prices may drop at other retailers below what Toys R Us are currently charging meaning you may well lose out financially. Retailers in Europe have a much more flexibility with pricing than in the US where the Wii U has a set recommended price at all retailers. Whether we see price reductions in the UK depends much on demand for the Wii U combined with supply from Nintendo. If history repeats itself as with the original Wii with Nintendo failing to keep up with demand, then prices are surely set to stay at much the same level as they currently are. No UK retailers have yet seemingly run out of their initial allocation. However in the US it is a much different picture with regards to Wii U stock levels. Large retailers such as GameStop, WalMart, Target and Toys R Us have all run out of their initial allocations of the Wii U and have suspended pre-orders. It is currently unknown whether more stock will be made available prior to the US release date of the 18th November. With such contrasting fortunes on both sides of the Atlantic it is difficult to predict what will happen in the UK with regards to future Wii U prices and stock levels. 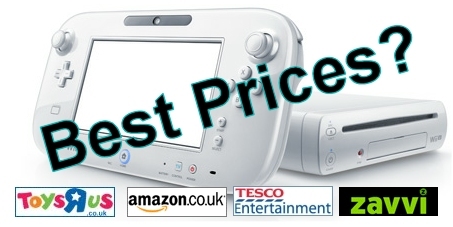 Here at Stock Informer we track all UK stock and prices real time with our Wii U Stock Checker.